You’ve likely experienced the wonder of stumbling across some gorgeous fungi while out in the natural world. Whether it be a cartoonish amanita muscaria sprouting out of grass or wood chips, or a cluster of delicious oyster mushrooms formed on the side of a down log, the thrill at finding such unique and attractive life never ceases for nature lovers. No matter the shroom you’ve encountered, it is actually just one small part of a huge organism. Mushrooms serve as the spore-spreading component of fungus. 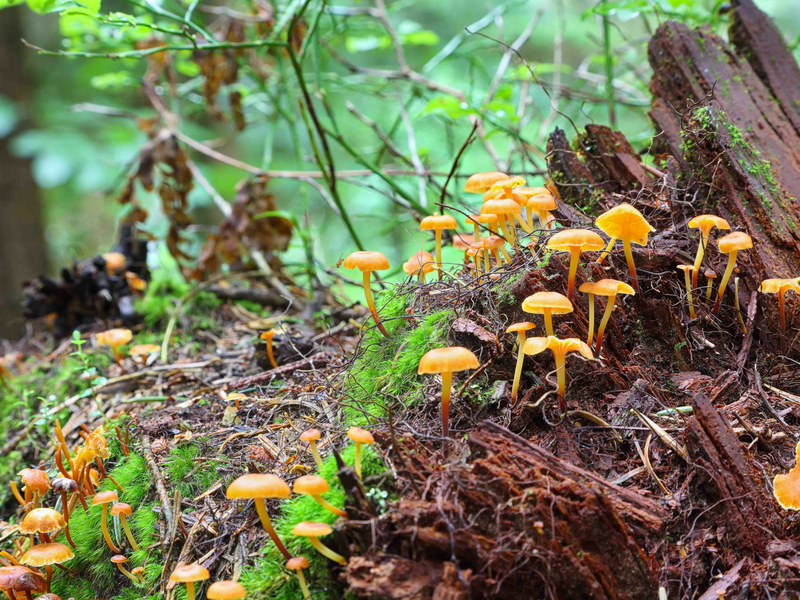 Similar to a fruit dropping seeds, mushrooms drop spores into the ground, and when inoculated, spores become a single-celled organism known as a hypha. 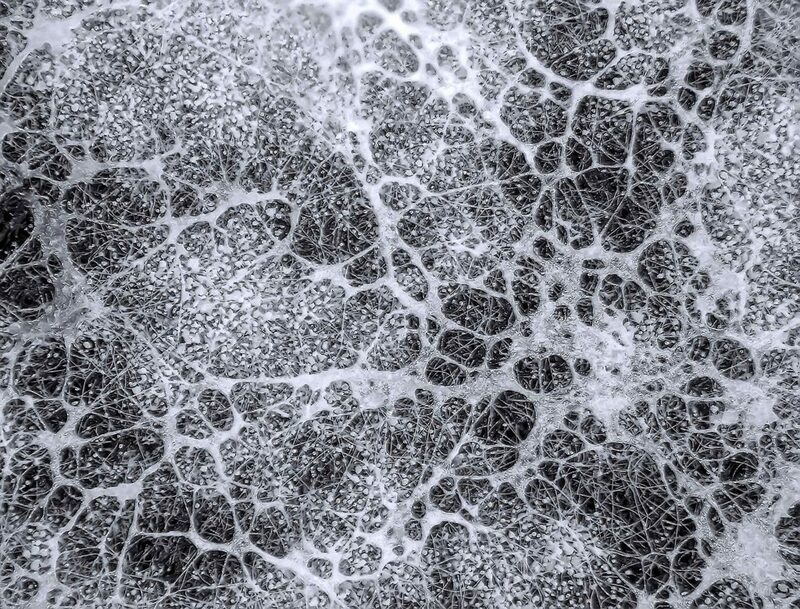 This thin, thread-like organism then spreads out underground exponentially into a huge branching system of white, thin, root-like masses, which are known as mycelium. At the end of this life cycle, a mushroom is formed, and once that mushroom reaches maturity, it begins to spread spores and start the cycle all over again. Mushrooms are just the means of reproducing mycelium. Mycelium, when present in soil, adds a huge number of benefits to any plants that grow with it — including cannabis. Saprophytic, a scavenger of sorts that feeds off dead organic matter. Parasitic, which absorbs nutrients from a live host. Mycorrhizae, which feeds off live plants, in a mutually beneficial relationship. Mycorrhizae is the mycelium most gardeners will want to focus on cultivating in their soil. So, how are mycorrhizae beneficial for plants? Mycorrhizae feed by attaching themselves to plant roots, which provide the fungi with sugars from photosynthesis that these darkness dwellers would otherwise be unable to access. In return, the mycorrhizae expand the plant’s root system and help it reach far-away nutrients that would otherwise be unavailable to the plant. Being attached directly to the root also helps nutrients, particularly phosphates, become more soluble for plants. Ask any cannabis grower who uses mycorrhizae in their mix of nutrients, and they’ll tell you this magical fungus also immensely stimulates root growth. This process also helps plants of all kinds become more drought resistant. According to a study, titled, “Improved soil structure and citrus growth after inoculation with three arbuscular mycorrhizal fungi under drought stress,” and published in the European Journal of Soil Biology, the researchers examined the benefits of mycorrhizae for citrus plants, with the results indicating that arbuscular mycorrhizal fungi benefitted citrus seedlings by improving the soil structure and increasing their propensity for drought resistance. Arbuscular mycorrhizae is the most common type of mycorrhizal mycelium used to build soil. Another benefit mycorrhizae offer is helping expunge heavy metals from groundwater, and thus reduce plants’ absorption of these often-toxic metals into their roots. Cannabis is a large annual herb and has an unfortunate habit of absorbing a large number of heavy metals if they’re present in the soil in which it’s grown. 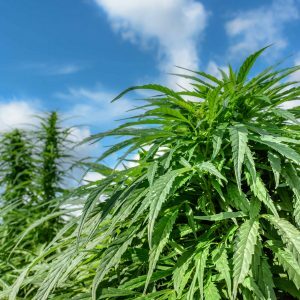 Therefore, outdoor growers should have their soil routinely tested to find ways to remediate the grow medium if it’s shown to contain above average levels of heavy metal toxicity. To that end, mycorrhizal fungi can be a powerful ally in this remediation process. Many studies have been conducted to determine whether mycorrhizae can reduce heavy metal absorption by plants. One such study is called “Effects of arbuscular mycorrhizal inoculation on plants growing on arsenic contaminated soil,” published by the European Journal of Soil Biology and available for access on ScienceDirect. According to this study, the presence of mycorrhizae “improved growth and arsenic accumulation” in some plant species, and “reduced only arsenic accumulation in plants but had no significant effect on plant growth,” in others. Finally, perhaps the most well-known benefit of mycorrhizae in soil is its ability to break down organic material and build soil, making it less prone to erosion and more nutritious for plant life. Harnessing the mysterious powers of mycorrhizae is a must for indoor and outdoor cannabis growers alike. There are several ways you can do this, ranging from extreme DIY methods, to totally store bought. 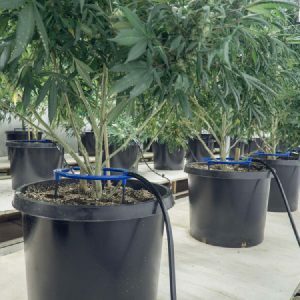 The method you choose may vary depending on whether you’re growing indoor or outdoor cannabis, the amount of time you have, and of course, your budget. Most plant life found in nature grows with mycorrhizal fungi. As such, you can take naturally occurring mycorrhizae and use it to grow the organisms in your own soil. This method uses ingredients that can either be harvested for free, or that most cannabis growers will easily and cheaply be able to acquire, if not already have on hand. Unfortunately, it is also the most time consuming, taking over three months to complete. It is also the least sterile method of the three mentioned, and for that reason may not be ideal for indoor plants. Go to a forest or meadow that is relatively untouched by humans and has a wide variety of trees and bushes, excluding pine or oak trees. Clear about two feet of any undergrowth beneath the tree, and carefully dig about a foot deep. Place the soil from that depth in a bucket or pot. Do this from a variety of trees and shrubs for best results; they can all be stored together. Mix your mycorrhizae soil samples with one part vermiculite, one part coir peat, and one part compost. Be sure to use a compost without added fertilizer, and don’t add any fertilizer as it can hinder, or even halt the growth of mycorrhizal fungi. No additional fertilizer should be used in the mycorrhizae cultivation process for this reason. Put the mixture into a large garden pot. Next, you’ll want to plant your host, or an annual plant that will help inoculate mycorrhizae in your soil. A good choice is a mix of grass seeds like wheat, corn, or better yet, bahiagrass, which is a well-studied mycorrhizae host, or allium seeds like onions, leeks or chives, and legume seeds such as alfalfa, clover or peas. Do not use spinach, sugar beet, lupine and members of the mustard family for your host seeds, as they’re among annual plants that do not form a symbiotic relationship with mycorrhizae. For best results, soak seeds for 10–12 hours before planting, and plant them close to one another. Alternate between types of seed as you plant to promote diversity. Using this method, the mycorrhizae colony will reach maturity in three months. In order to force the fungus into a reproductive state 10 days before harvesting, cut the plants down to the stem and withhold all water. This will kill the plants, but encourage the mycorrhizae to release the spores. After 10 days, the mycorrhizal fungi will be ready to harvest and use in your soil. Harvest the beneficial fungi by pulling the dead plants up by their roots, carefully pulling them into smaller pieces, and adding the root system, which has been fully “infected” by mycorrhiza, to your soil. Compost tea promotes mycorrhizae growth and boosts nutrition for healthy cannabis crops. Another way to promote mycorrhizae growth is to use a compost tea. Compost teas are a simpler, more sterile, quicker way to promote mycorrhizae growth than by growing your own. Purchasing all the ingredients and a compost tea brewer — whether homemade or pre-assembled — can get a bit pricey, however. Compost teas promote the growth of fungus that resides in compost, and in this recipe, forest and garden soil. Compost teas can be formulated to promote the growth of either beneficial bacteria or fungi, depending on the plant you’re growing. For cannabis, you’ll want to promote fungi growth. The following recipe is meant for a five-gallon brewer and is optimal for encouraging fungi growth in soil. Make sure none of these ingredients contain any antibiotics or preservatives, as that will hurt the composting process. Five-gallon compost tea brewers will be adequate for most home gardens. 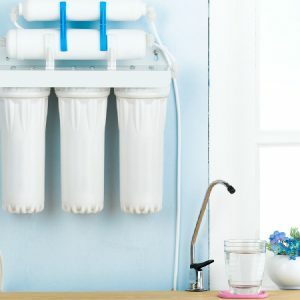 If you’re building your own compost tea brewer, you’ll need a food-safe five-gallon bucket, an air pump, an aerator device, and a 400-micron mesh bag. You can find tons of instructions online on how to build these. There’s also the option of buying one premade, which does cost a bit more. Fill your five-gallon compost brewer with dechlorinated water. Chlorine will kill all the beneficial microbes, so either use distilled water or reverse osmosis water. Add the worm castings, fungal-dominated compost, garden soil and forest soil to the mesh bag, or straight into the water, depending on your brewer. Wait until the water gets to room temperature, or if you’re using a heater, until it gets to about 75 degrees F.
Add molasses, kelp, humic acids, fish hydrolysate, and rock dust to the water. Wait 12–48 hours, depending on your brewer and method. Strain the tea, or stir, depending on the method chosen. As this compost tea is brewed specifically to promote root growth and build soil, you’ll want to use it as a soil drench and not a foliar application. Apply it to plants immediately after it’s done brewing. If you would prefer to purchase a store-bought organic compost tea, Advanced Nutrients’ Mother Earth Super Tea Organic OIM is the only compost tea on that market that’s certified organic by the state of California. The easiest and most affordable way to promote mycorrhizae growth in your soil is to buy a mycorrhizae-forming product. 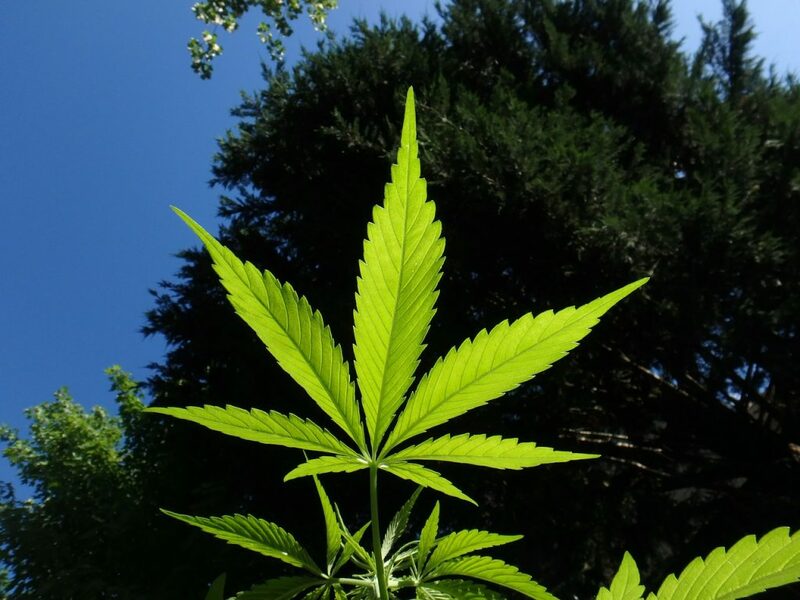 There are a ton on the market made just for cannabis plants. Just do your research as you would with any cannabis nutrient product, and follow the directions on the label. It’s a dead simple and foolproof method for adding beneficial fungi to your soil. Make sure cannabis roots make direct contact with mycorrhizae. Choose a fertilizer with little extra phosphate. Till your soil as little as possible. Read up on these fantastic fungi! You can choose from a wide variety of books and websites, which cite lifelong experts in the field. The more you know about it, the better use you’ll be able to make of it.